If you asked me what sweets I grew up eating, I would tell you that white rabbit candy (大白兔奶糖) was my candy of choice. 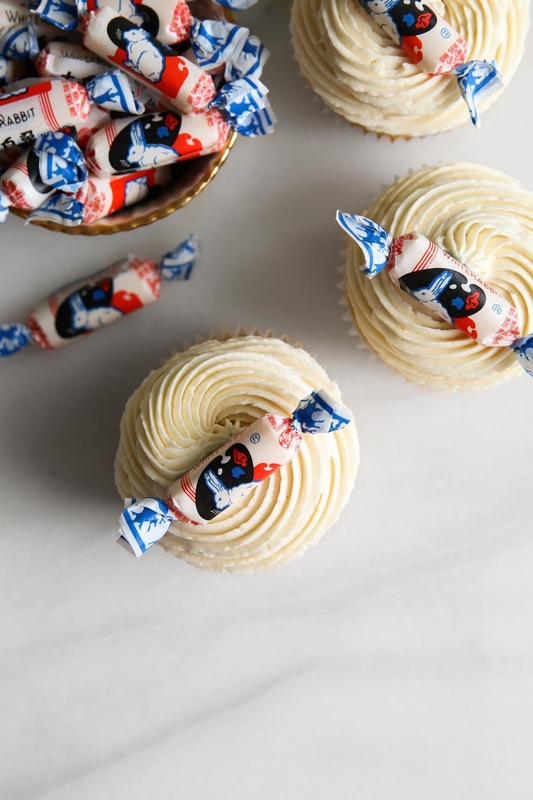 Tucked inside the iconic blue, red, and black wrapper, white rabbit candy is a creamy, vanilla-scented candy similar to nougat or taffy in texture. Each candy is wrapped in a printed wax paper wrapper, but within this, the sticky candies are again wrapped in a thin edible paper-like wrapping made from sticky rice, which is meant to be eaten with the candy. The candy has always been quite affordable, being no more than two or three dollars for a large bag, and could be found at most if not all Chinese grocery stores. As I grew up, my consumption of white rabbit candy decreased (I probably have not had one in years!) and it was not until recently that white rabbit candy came back to my (and apparently everyone's) radar. I first noticed the return of white rabbit candy when I saw Wanderlust Creamy in Los Angeles collaborated with Foodbeast to launch a white rabbit candy ice cream in celebration of Chinese New Year. That ice cream flavour went quite viral. Since those ice cream cones first surfaced the internet, so many iterations of white rabbit candy have popped up including white rabbit cookies (hi Andrew!! ), bubble tea, cakes, and more forms of ice cream. I love all these homages to the the original milky candy and would never give up an opportunity to try them. 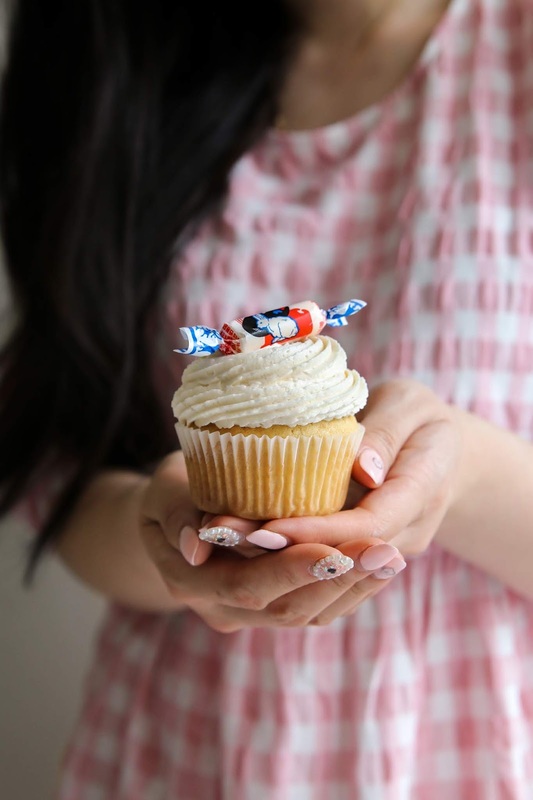 So here is my homage to my favourite candy — a light vanilla cupcakes topped with the fluffiest white rabbit candy buttercream. 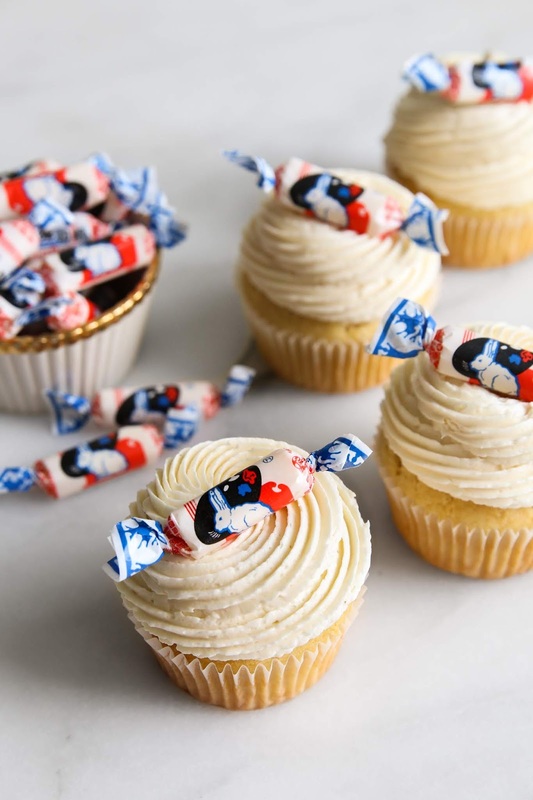 White rabbit candies are cooked down in milk to create a white rabbit syrup, which is then whipped into the buttercream. 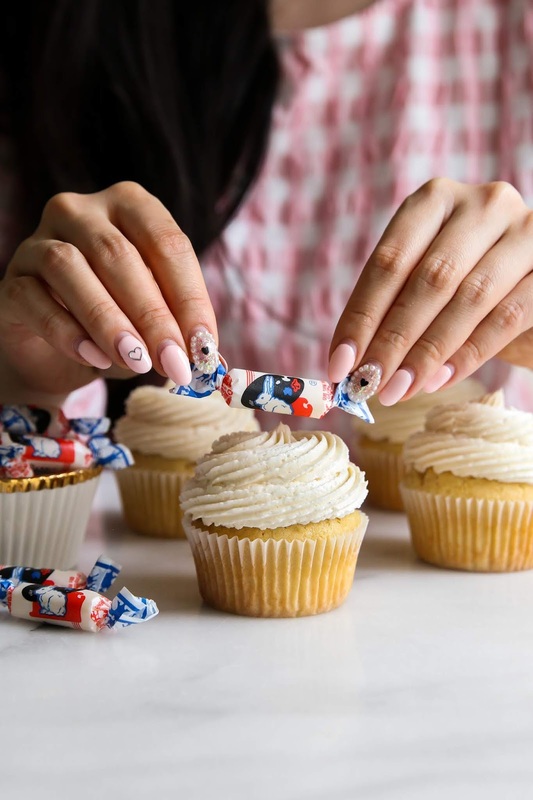 Each cupcake gets its own little candy to make sure you get an extra treat with your treat. Preheat oven to 350F and line a cupcake pan. In a bowl of a mixer, beat butter and sugar until smooth. Add egg and mix until incorporated. In a medium-sized bowl, whisk to combine flour, cornstarch, baking powder, baking soda, and salt. Set aside. In a measuring cup, combine sour cream, vegetable oil, vanilla extract, and milk. Add the dry ingredients the butter mixture and while the mixer is running on low, slowly add the milk mixture. Mix until combined. 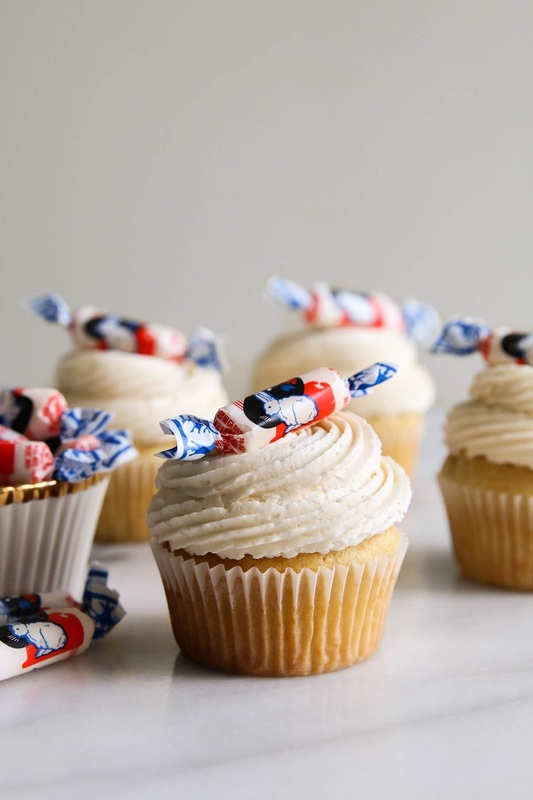 Fill cupcake liners 3/4 way full and bake for 14 - 16 minutes. They are done when they are lightly golden brown and when a toothpick comes out without wet batter stuck to it. In a small pot over medium heat, combine white rabbit candy and milk. The candy will slowly melt and turn the mixture syrupy. Keep on stirring with a rubber spatula until all the candy has fully melted. Once the candy has all melted, set mixture aside and let cool. In the bowl of a mixer, beat butter until light and fluffy. Add icing sugar, one cup at a time, and mix until fully incorporated. Add vanilla and cooled white rabbit candy syrup. 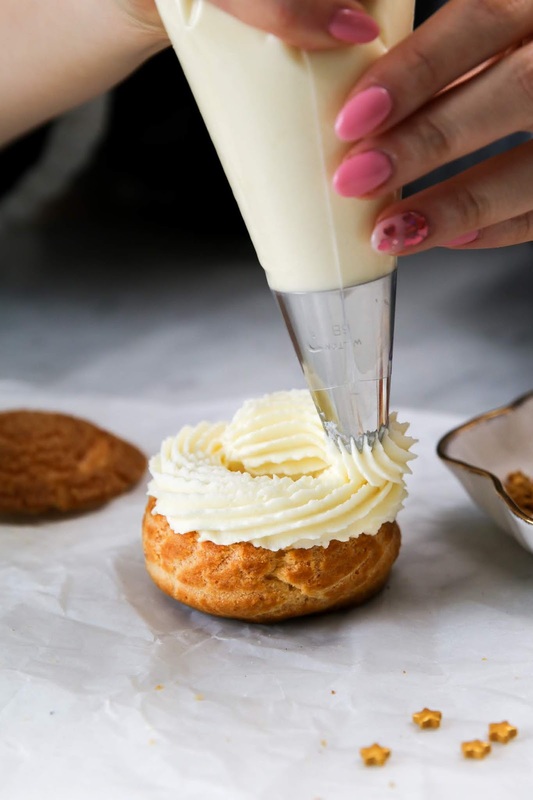 Continue beating buttercream on high speed until fluffy, 3 - 5 minutes. 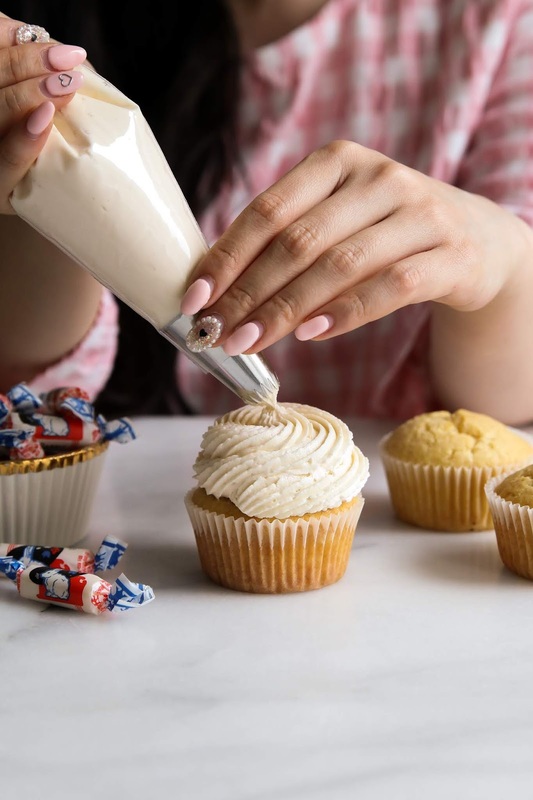 Transfer buttercream to a piping bag fitted with a piping tip and decorate away. 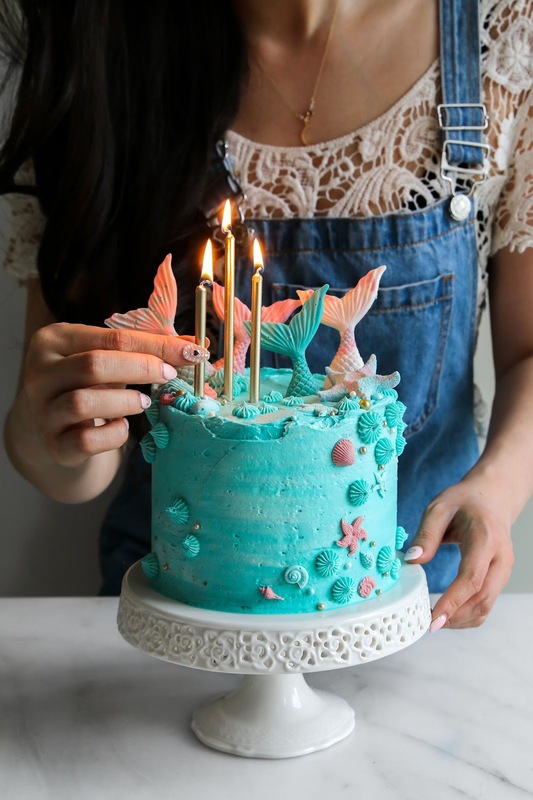 Every year I make myself a birthday cake (cue last year's peanut butter and jelly cake and 2017's chocolate cake) and despite some big projects that I have been working on, I still managed to make an over-the-top cake for this year's celebration. 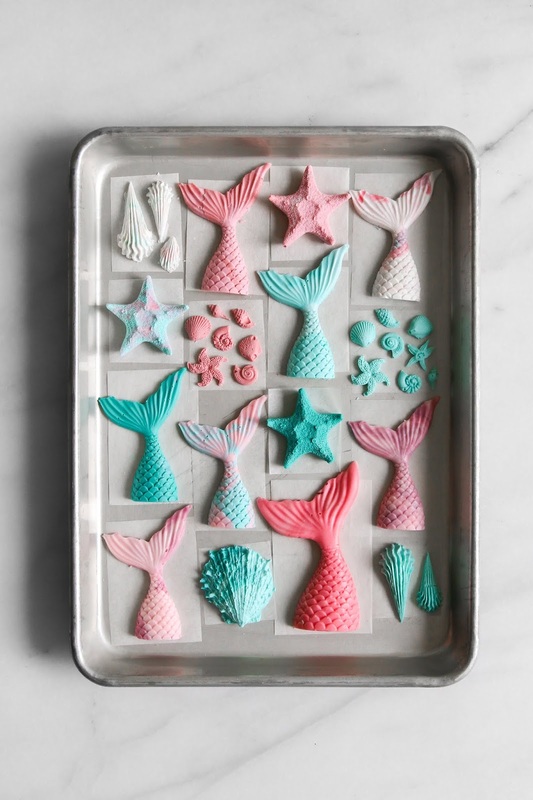 I ordered these mermaid tail and sea shell chocolate molds quite a while ago, with the intention of making the cake last summer. 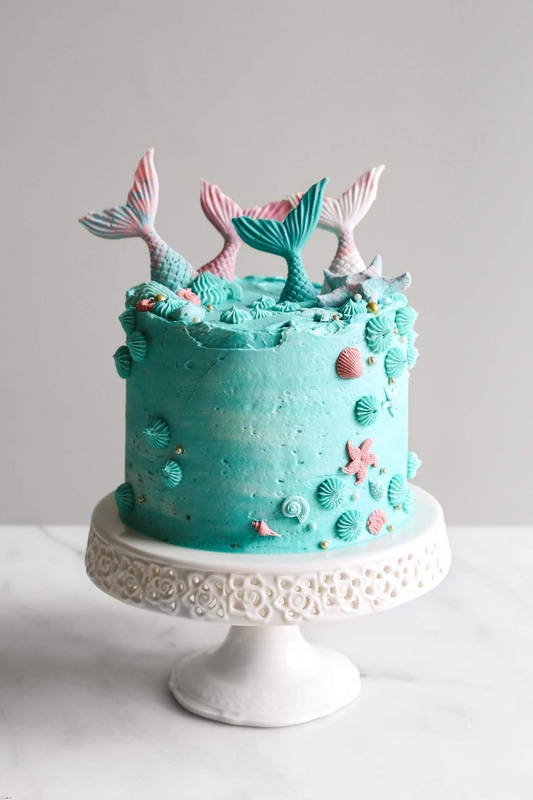 I then got caught up with making all the other seasonal cakes and cookies and this summery ocean-themed cake got pushed aside. I am glad I 'forgot' about this cake and inadvertently saved it for my birthday. 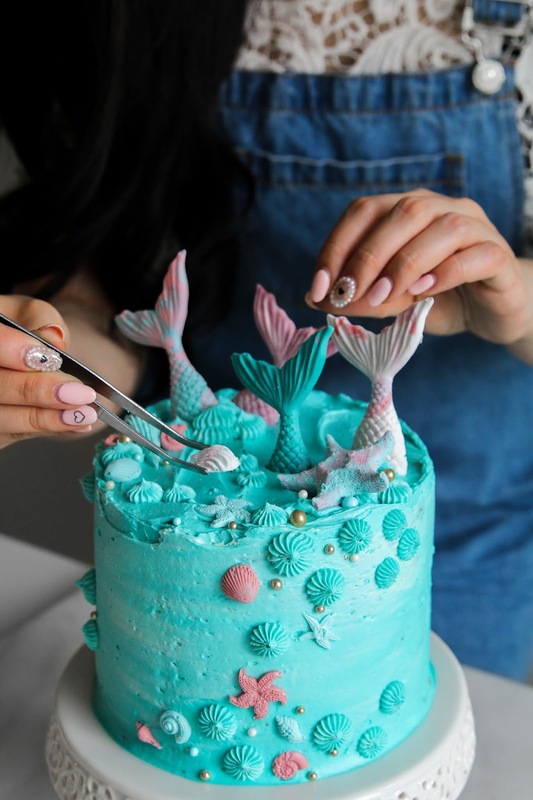 This cake is everything I love — mermaids, pastels, gold accents, overly ornamental cake decorations. Despite being only a couple months in to 2019, I think 2019 has already been and will continue to be one of the most exciting years for this blog. In the last three months, I accomplished many things that were a first for me: recording simple videos for Instagram to give you different types of content (shaker cookies! 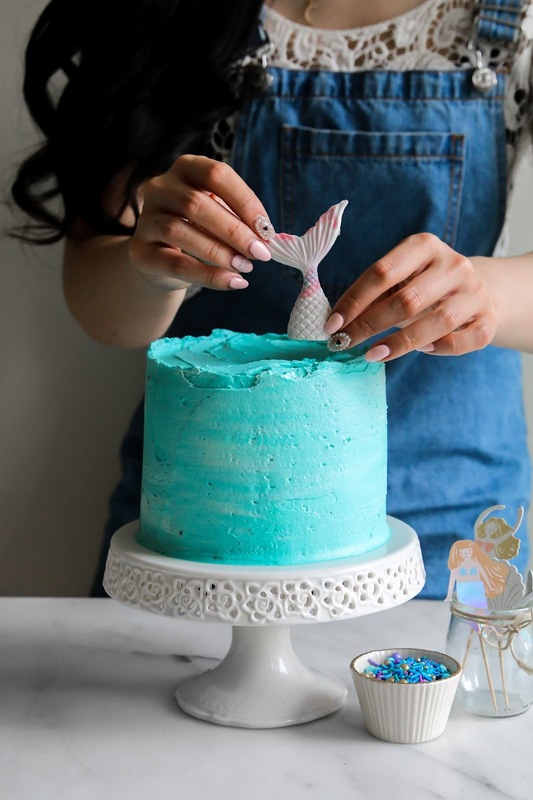 buttercream piping! ), making conchas despite my fear of working with yeast, and working on my first product collaboration with my favourite chocolate and pastry shop in the city. I also started working on a much larger project which I will be sharing with all of you very soon. At times, this workload gets quite overwhelming — I still work a full-time job and collectively it feels like I am working three jobs at once. 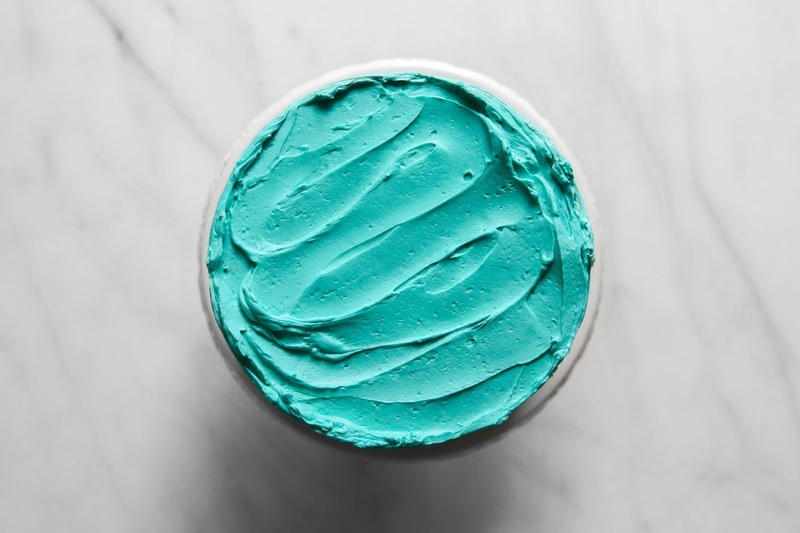 On some days, I would have all the room temperature butter on the counter, icing sugar spilled on the floor, and sprinkles rolling across my apartment floor, as I question myself what I am actually doing. It takes some time until I reach some sort of rational conclusion but I eventually get there. 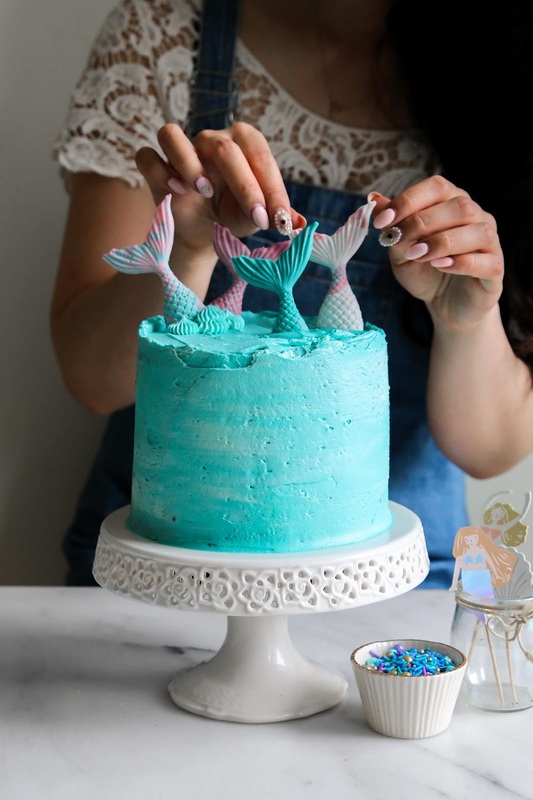 It is because nothing beats the feeling of creating the perfect layer cake and the seeing you love and recreate that cake. 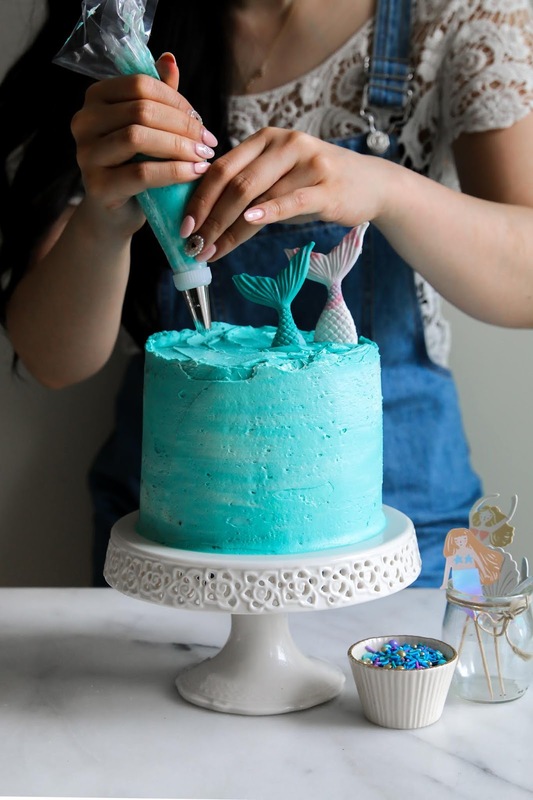 I then clean up all the spilled sugar and I finish icing my cake so I can share it with you here. 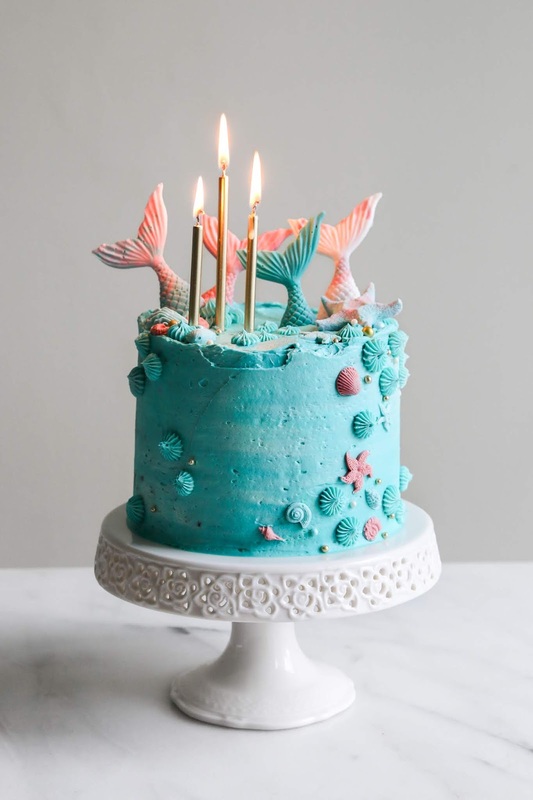 This cake is my birthday cake but I also want it to be a celebration of what 2019 has been and what has yet to come. 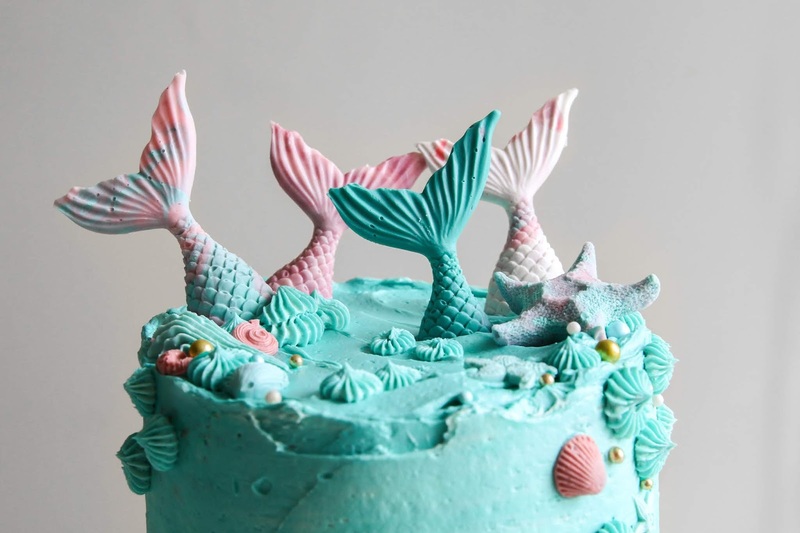 To me, nothing feels as festive as white cake layers studded with rainbow coloured sprinkles. Funfetti cake will always be my celebratory cake. 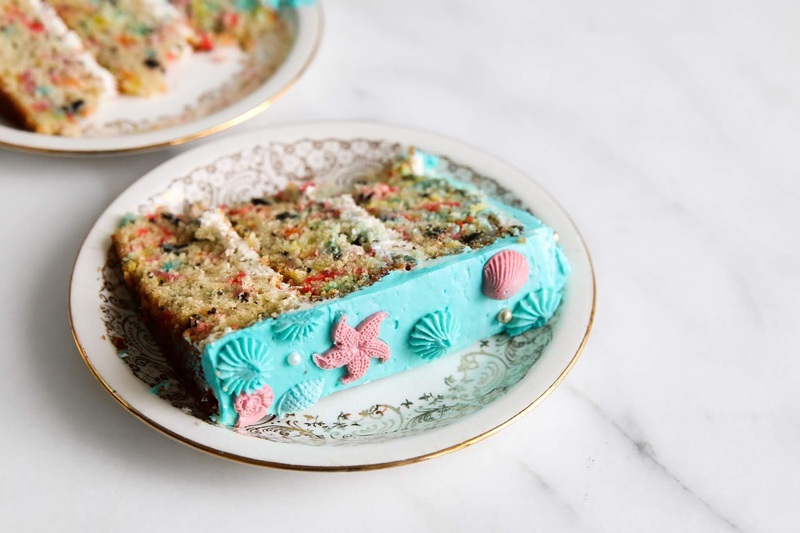 To add more fun to these layers, I added chopped Oreo cookies to the batter, making this cake a hybrid between funfetti and cookies and cream. 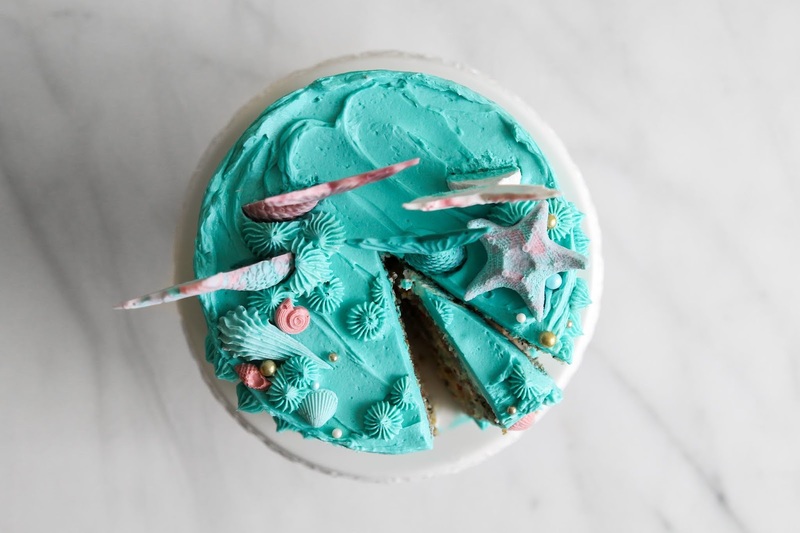 This way, I do not have to choose between two of my favourite cake flavours and the multicoloured add-ins represent all the different opportunities this year has to offer. I hope you find many reasons to celebrate this year as well. Preheat oven to 350F and prepare three 6-inch cake pans. In a medium-sized bowl, whisk together flour, cornstarch, baking powder, baking soda, and salt. Set aside. 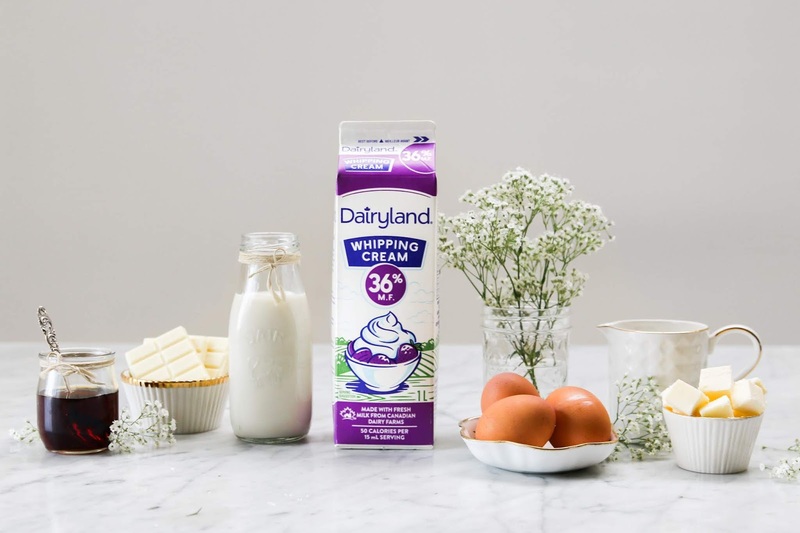 In a small bowl, whisk together sour cream, milk, and vanilla extract. Set aside. In the bowl of a mixer, beat butter and sugar at medium speed until smooth and creamy. Add egg whites to the butter mixture, in a few increments, making sure the previous addition has been fully mixed in before adding the next. With the mixer on low, add in half of the dry ingredients followed by the wet ingredients. Add the second half of the dry ingredients and mix until combined. With a rubber spatula, gently fold in the chopped Oreo cookies and sprinkles. 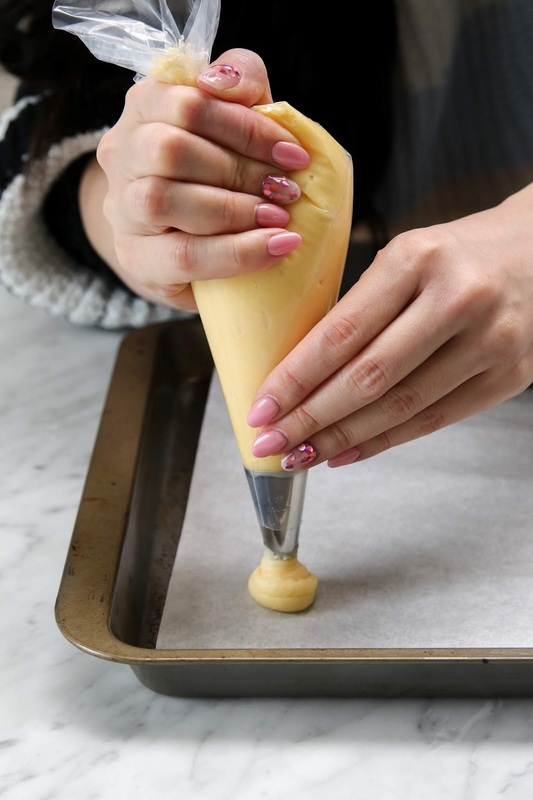 In the bowl of a mixer, beat butter at medium speed until smooth and creamy. Gradually add the powdered sugar cup by cup, adding the next cup after the previous one has been mixed in. Add vanilla extract and milk with mixer at low speed and mix until blended. 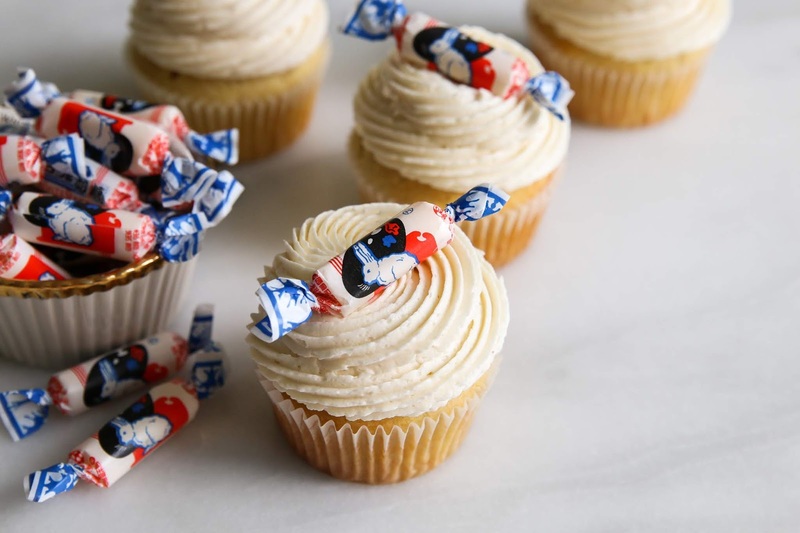 Beat at medium-high speed for 3 - 5 minutes, until buttercream is extremely smooth and fluffy. If needed, add additional powered sugar or milk until desired consistency. 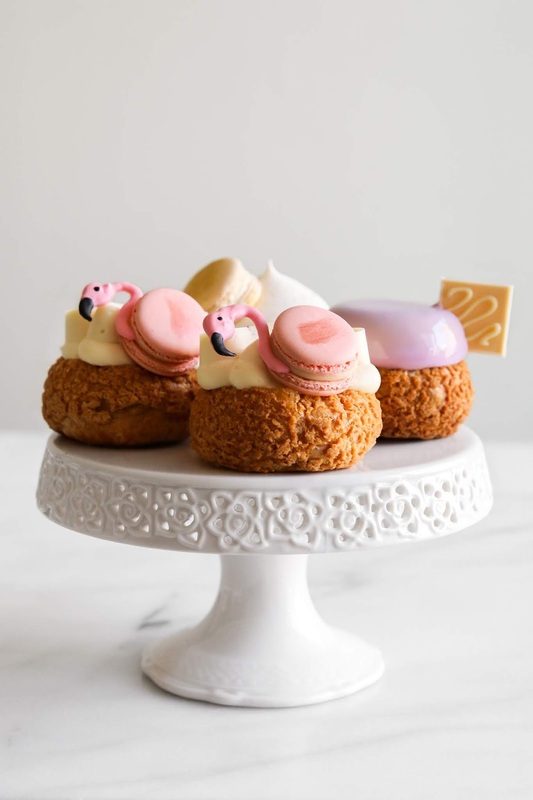 When people ask me what are some of the best bakeries and pastry shops one must visit in Vancouver, Beta 5 has always been one of the places I name first. I would love to say that I have been in love and visited Beta 5 every week since week one, but I actually did not start going until a couple of years after they first opened. 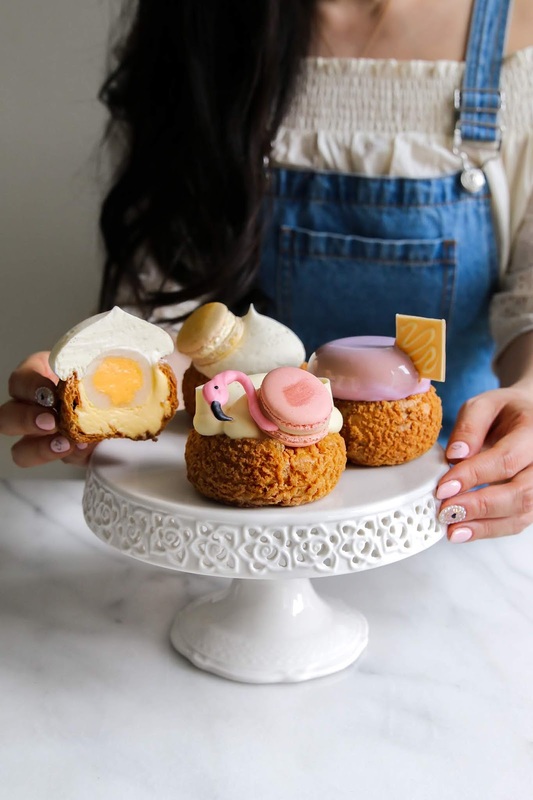 Like their bio suggests, they are indeed tucked away like a secret — they are not in the most central spot in Vancouver but their amazing pastry and chocolate program makes the trek extremely worthwhile. I have shown my love for their pastries numerous times (ex. 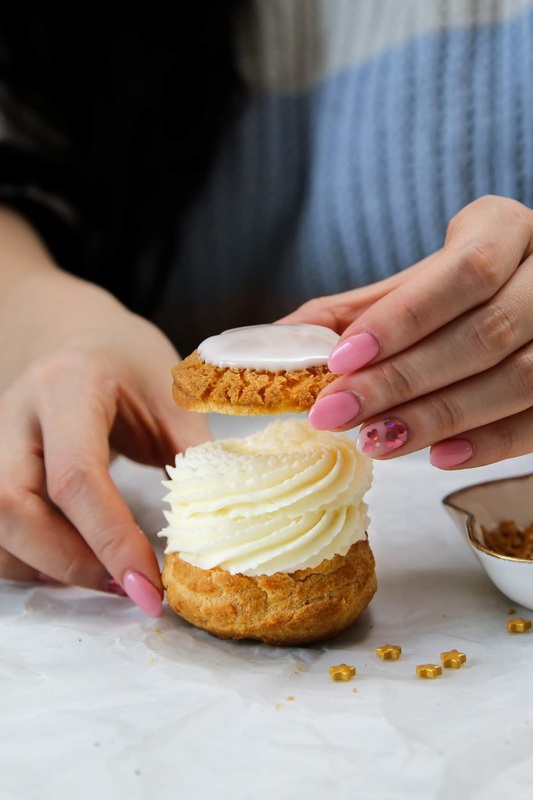 douglas fir cream puff, strawberry frosted flake croissant, collection of flower-themed cream puffs) and many of you seem to love it too. 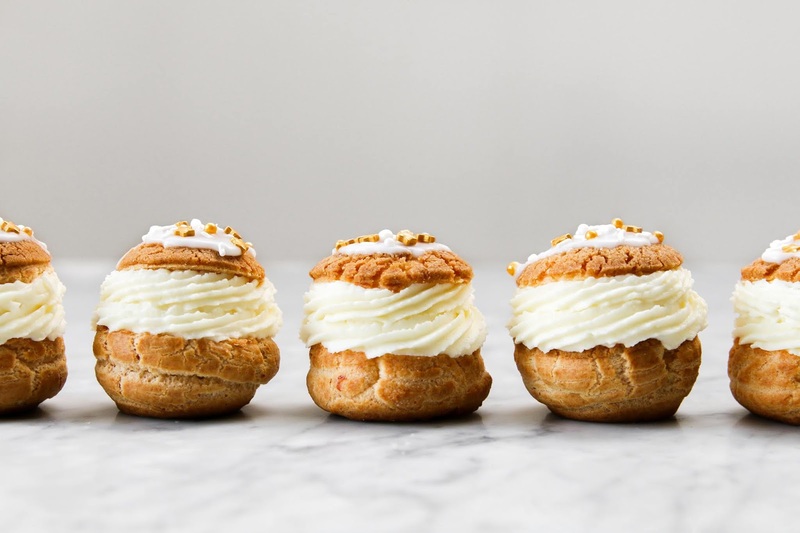 So when the team at Beta 5 reached out and suggested that we work together to create a line of featured cream puffs, I immediately said yes. It was my first (and theirs too) collaboration and I could not have asked for a better team to work with. 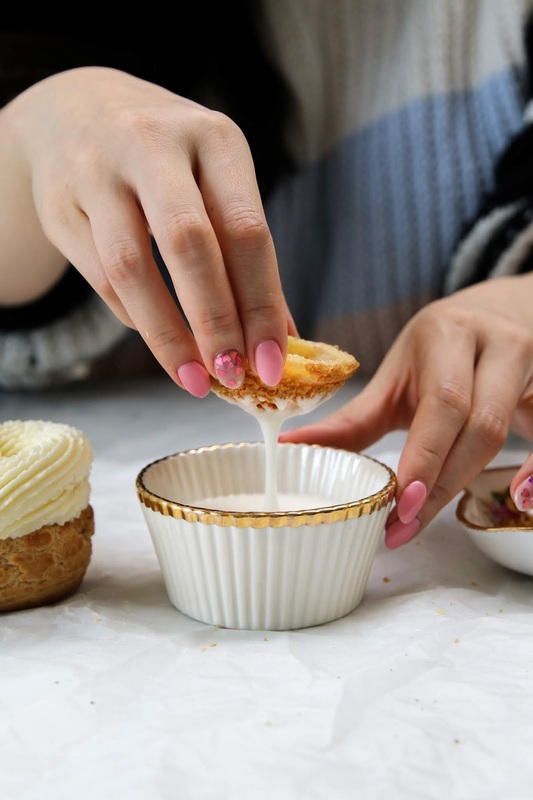 We started meeting one month before the cream puff launch date and I thought it would be fun to break it down and let you know how this all happened! Beta5 gave me homework before our first meeting. 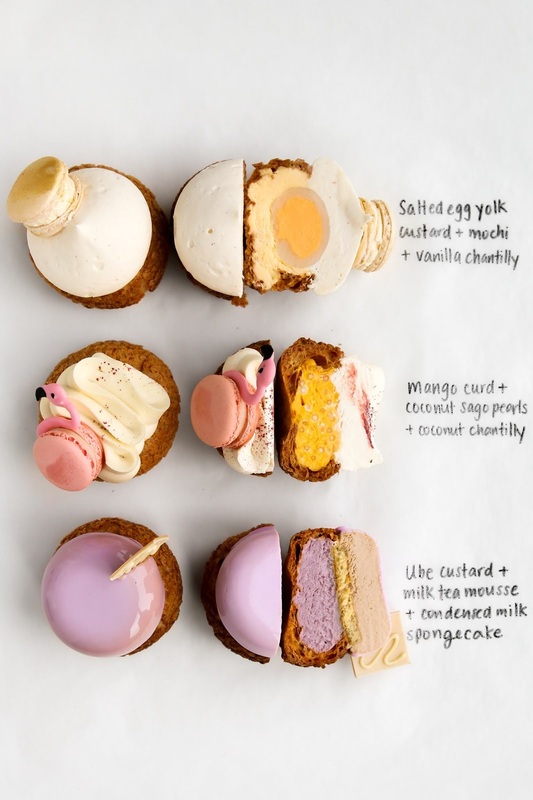 My main task for week one was to brainstorm ideas for both flavours and look of the three cream puffs. I wanted to make sure there was one underlying theme that tied all three puffs together in terms of both flavour and design. 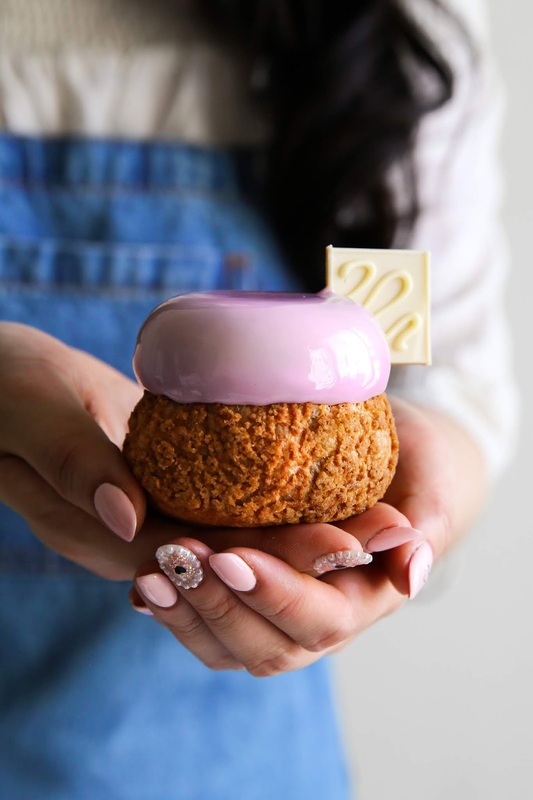 I created a mock up for two sets of cream puffs — one resonating with what you see more on my blog (i.e., the cute characters, pastel colours, all whimsical vibes) and what I associate with Beta 5 creations (i.e., really sleek presentation of pastries with an emphasis on technical precision and design). 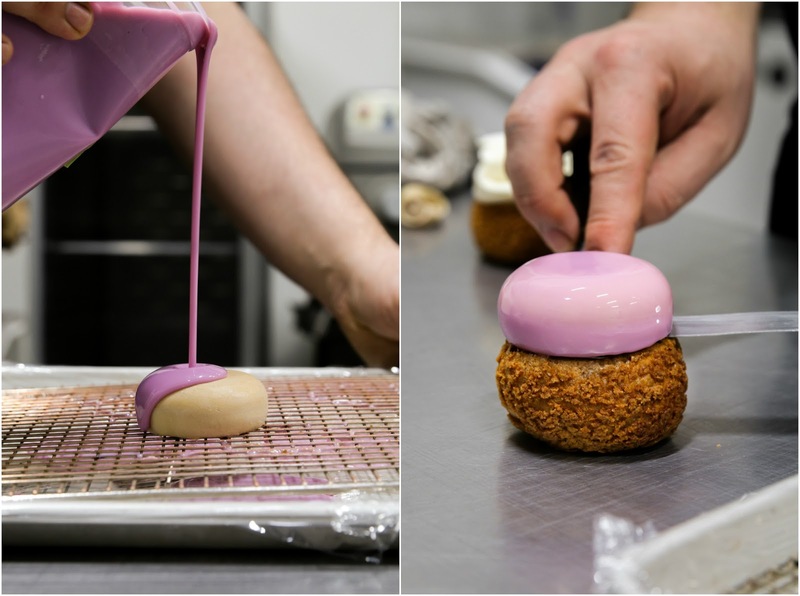 We took elements from both sets to create cream puffs that perfectly represented both of our own brands. 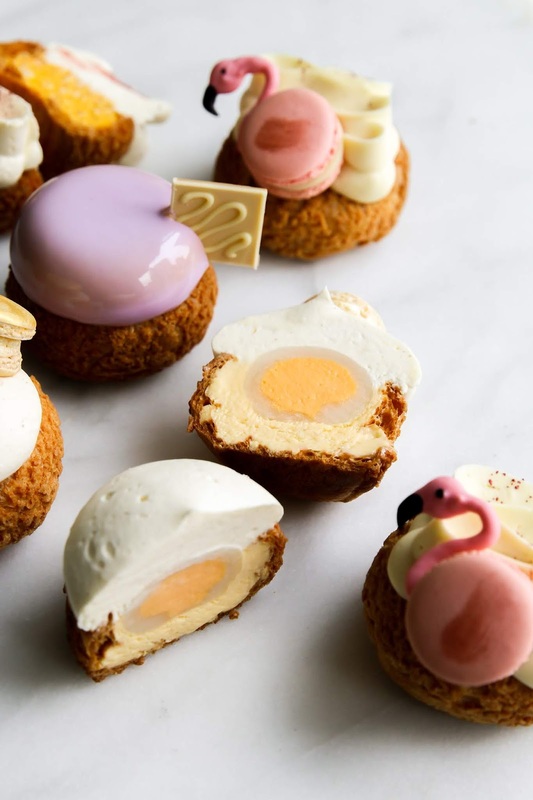 In terms of flavours, I really wanted to play with flavours that I grew up eating and flavours you would not normally see in non-Asian pastries. I presented salted egg yolk custard (流沙包) mochi, mango coconut sago (芒果西米露), and milk tea toast (奶茶+煉奶西多) and the team seemed quite excited to work with these flavours that they do not normally offer in the store. We also discussed some timeline things. The first round of taste testing and design prototyping! 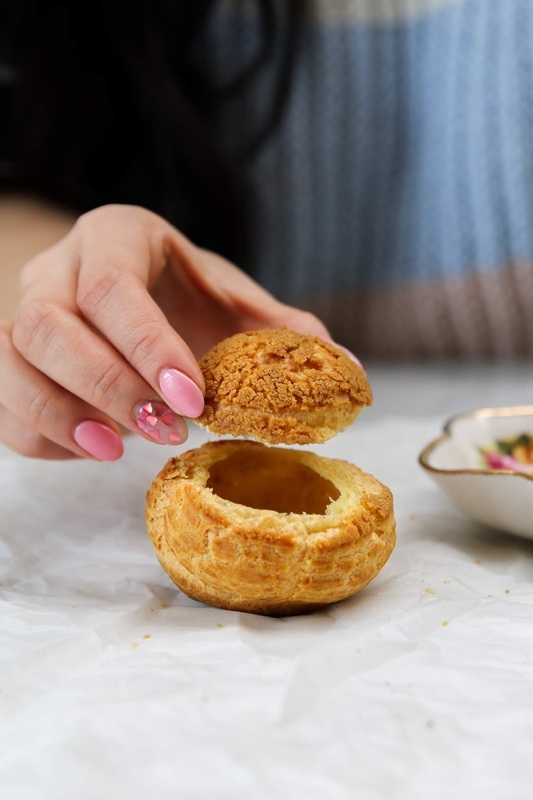 We tasted and discussed the look of the first set of cream puffs. 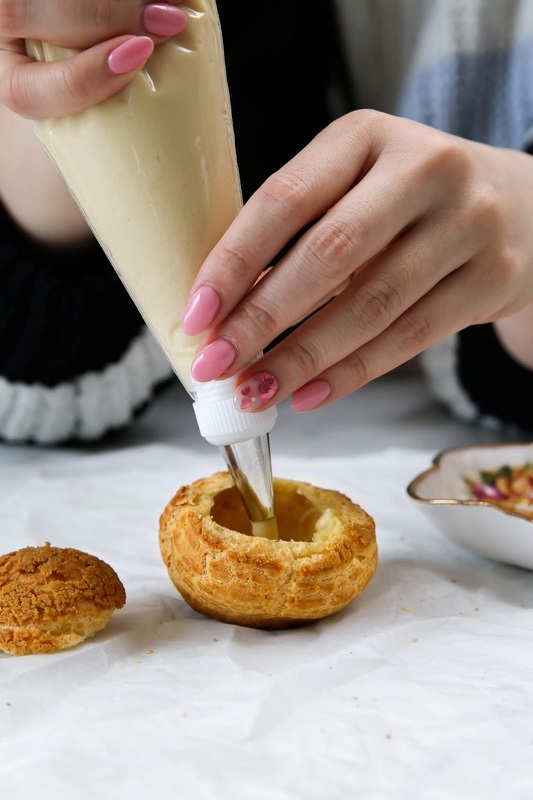 Maybe we should make the salted egg yolk custard a bit saltier? 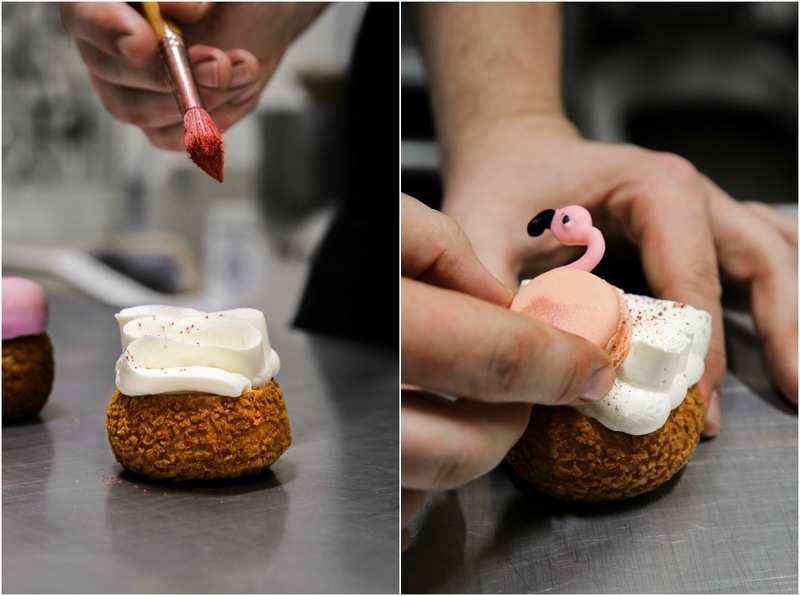 Let's add a swoosh to the flamingo macaron! Let's add ube to to the milk tea puff for a pop of colour and for an extra layer of flavour? More taste testing and finalizing of the flavours and design of all three puffs! At this point, the cream puffs were 99% finalized. Most of the time this week was spent photographing, editing, and drafting up the announcement of this collaboration to the public. 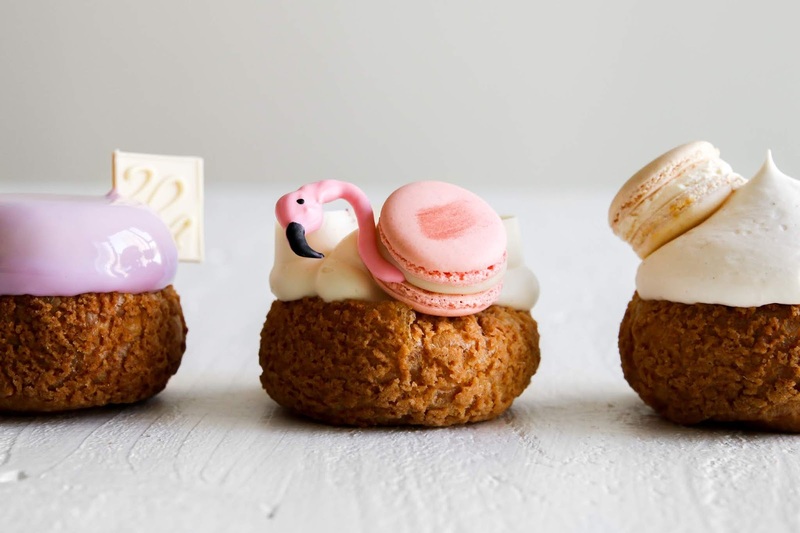 We also spent a good amount of time gushing over how cute the flamingo macaron was. Week 4 aka. the launch! The official launch of the cream puffs was yesterday at 10am. 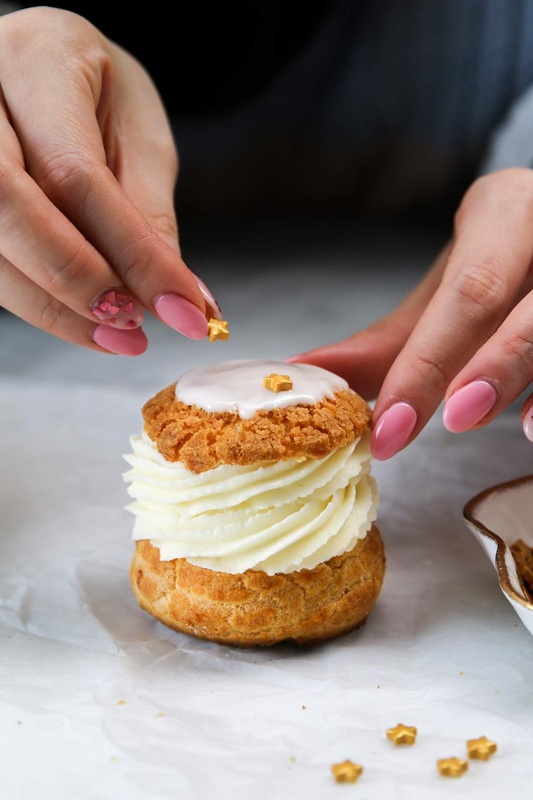 Pre-orders for the cream puffs started Friday morning at 9am and due to everyone's excitement, all the pre-orders for the entire week were sold out within the first two hours (thank you!). A second set of pre-orders for Saturday sold out within seven minutes. Eeeeep! 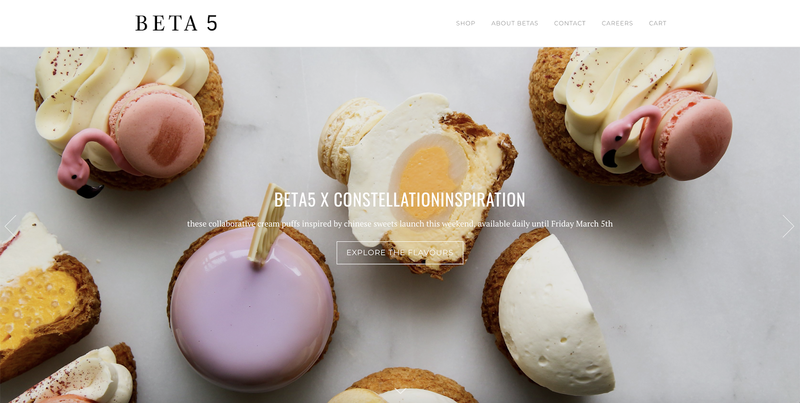 I hung out at Beta 5 for most of the launch day and was so overwhelmed by your excitement of the cream puffs. I got to meet many of you that pre-ordered puffs and walk-in customers and I also got to say hi to many friends that made the trek to the shop for some puffs. We sold out of cream puffs before noon, restocked, and sold out again in the early afternoon. 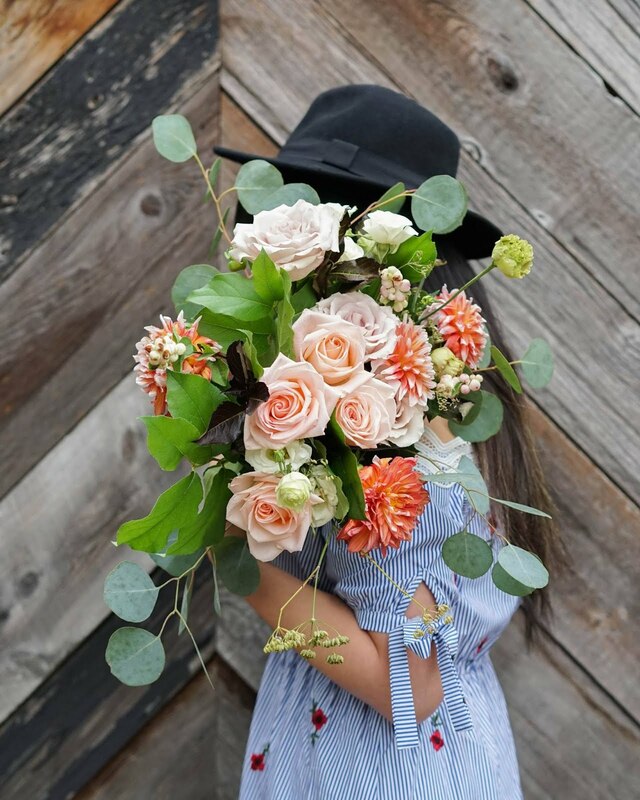 The remainder of the day was spent gushing over the amazing photos many of you shared on instagram. Thank you SO much for being extremely supportive of my first collaboration. I was so nervous before the launch of these puffs ("What if no one comes?" "What if no one likes them?") but am so happy with how everything turned out. Another big thank you to the Beta 5 team for thinking I am cool enough to be a collaborator — you guys are so incredibly talented. This post is sponsored by Saputo. The opinions on this blog, as always, are my own. Thank you Saputo for supporting Constellation Inspiration! Recently, more than ever, I can be found with flour on my clothes, frosting in my hair, and sprinkles in the pockets of my jeans. It seems like as of lately I have been baking and creating lots more than I ever have before — and I am totally okay with it. 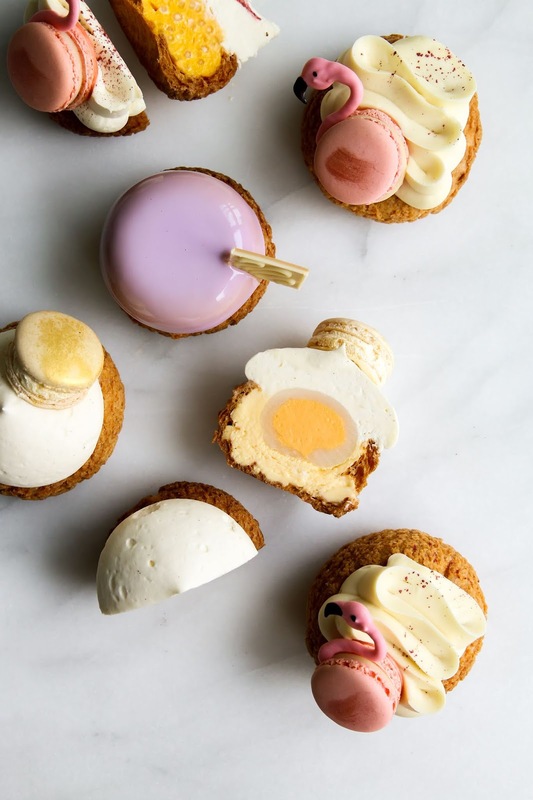 I have been lost in the world of Japanese decorative cookies, but I will always find myself coming back for choux. 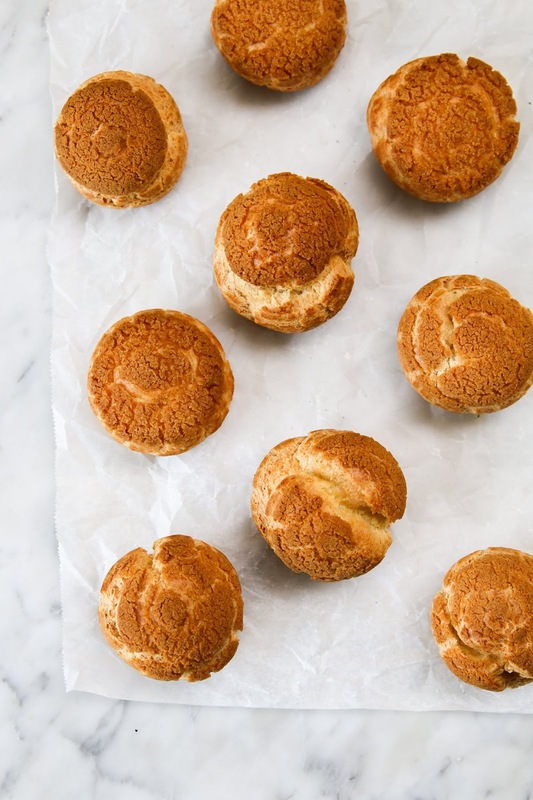 Cream puffs, despite a few batches here and there that don’t rise properly, will always be one of my favourite things to make [exhibit a, exhibit b, exhibit c]. 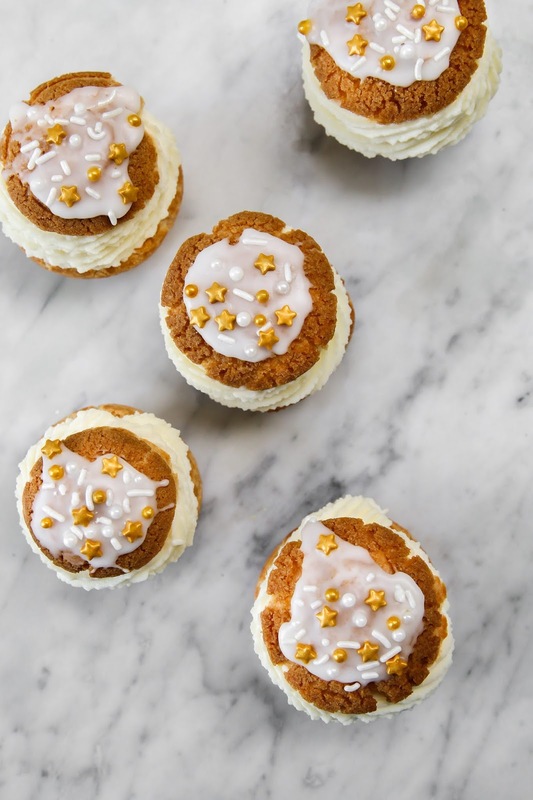 I am keeping it short and simple here today because these maple white chocolate cream puffs are the star and I do not want any more words to keep you from trying them out yourself. 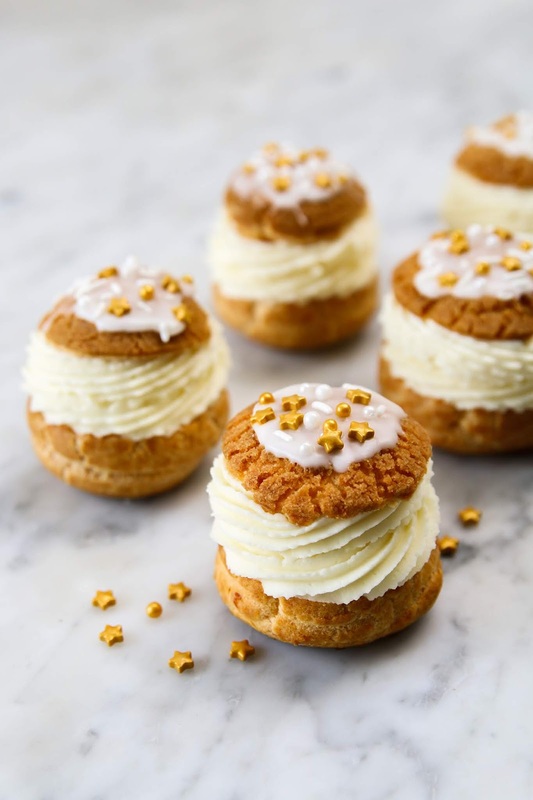 These cream puffs have all the good stuff — crisp choux buns with craquelin of course, maple pastry cream, and whipped white chocolate ganache. 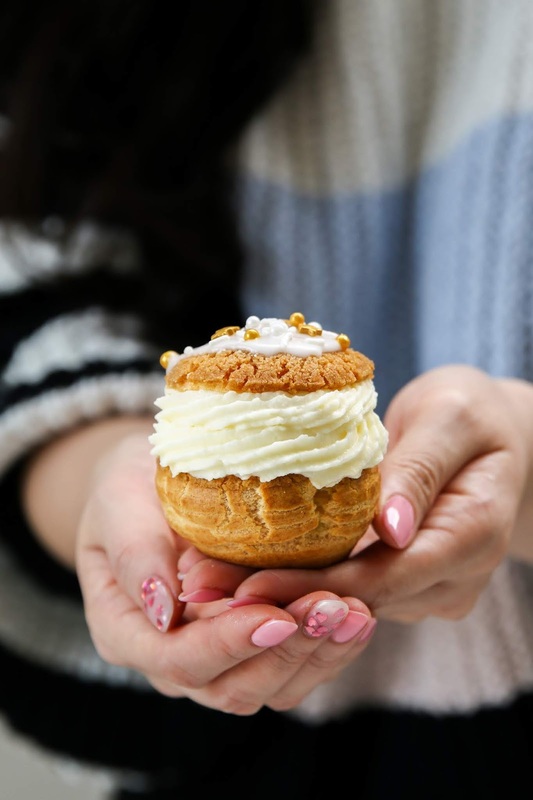 The best thing about cream puffs is that you can easily fill and top your choux with anything or everything you like, but this has been my favourite combination as of late. Using a sharp knife, split vanilla bean in half lengthways and scrape out seeds. Add bean and seeds to milk mixture.